Mal Benning has been among the star performers. Mal Benning says being picked as part of the Sky Bet League Two Team of the Season was a reward for his hard work. 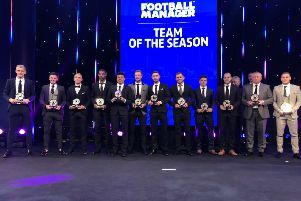 Benning was included in the side at the EFL Awards last weekend, alongside team-mates Tyler Walker, CJ Hamilton and Krystian Pearce. And the wing-back is pleased to have been recognised. He said: "It was a very special moment for me and the other three guys. It’s a big achievement for us to be in the team and of course for the club as a whole to have four players in it. “It made me feel like my hard work’s paid off in a sense, because having been released from another club and come here, Mansfield have been a breath of fresh air for me and I’m comfortable here, so to see my hard work pay off is a good feeling. “I feel like I’ve done well each season but with us challenging at the top of the league it’s added to how well I’ve done given the team is doing well." 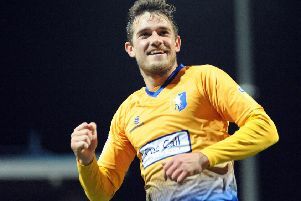 Having arrived in 2015, Benning feels that this has been his best campaign in a Stags shirt, albeit one he hopes to supplement with a few more goals. He said: “I think in terms of consistency it’s been my best season since I came here. If I was honest, I’d like to have a couple more goals before the end of the season as I play at wing back and would like to add more to my tally. “My favourite goal is still the right-footer at Dagenham in 2015 but in terms of a collective team goal then the Chesterfield one stands out nearly a year ago."